VH-JET#1 & Her Sisters - What's so special about VH-EBA anyway? WHAT'S SO SPECIAL ABOUT VH-EBA ANYWAY? Given that the major selling point of air travel is speed, this aeroplane is historically significant, for it ushered in a new era for Australian air travellers. With the advent of jet power, came a quantum leap in speed which was not eclipsed until the advent of the Concorde. Even today, with every surviving Concorde relegated to the status of museum exhibit, the latest generation jetliners are marginally slower than the 707 was in the sixties. 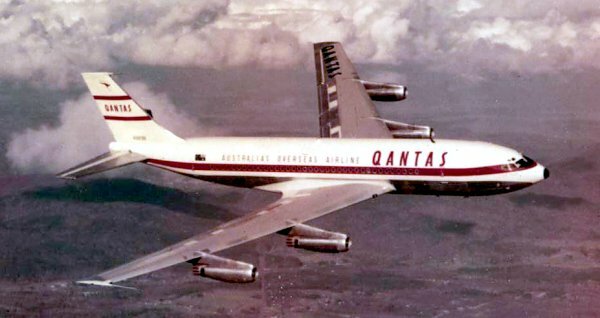 So impressive was the speed of the 707 that there was speculation in the newspapers of the day that Qantas possessed an aeroplane faster than anything operated by the RAAF. There was even mischievous speculation in some journals that the argument might be settled with a race! With the passage of 46 years since those heady days, it might be difficult for some to understand why there would be any interest in trying to save an old jetliner which lies abandoned on the other side of the world? It can't be that the aeroplane aspires to commercial operation, for she is well past her "use by" date and even a twilight career as an aerial "tramp steamer" has passed her by. For this old aeroplane to lure retired pilots and engineers away from fishing and sailing and to seduce current pilots and engineers away from the "latest and greatest", there must be something special about her. She must be something special for grown men to endure sleepless nights worrying that this aeroplane might go the way of almost all retired airliners, heartlessly torn apart by machines normally given to earth-moving operations. She can't be special solely because she's a Boeing 707 for there are hundreds of them around the world. The Royal Australian Air Force still use them as does the United States Air Force and the air forces of many other nations. Some are still in service as freighters and plush executive jets, so why go to the other side of the world when there are better examples closer to home? The answer lies in the fact that this particular Boeing 707 is indeed something special. Aeroplanes with so many claims to fame rarely survive long enough to be appreciated for their historical significance, but here again this aeroplane is special. Not only does she survive but she is also complete and potentially flyable! Not many airlines are given the opportunity to see preserved their very first aeroplane or even their first of type. Trans-Australia Airlines (later absorbed into the Qantas Group) can make this claim. The aeroplane with which they operated their very first service in 1946, DC-3 VH-AES, survives in airworthy condition. Today, Qantas has the good fortune to have been presented with an opportunity to see their very first jet aeroplane preserved for future generations to admire.